Bar Association of Illinois from 1927-28. Bartleme made important symbolic contributions to the feminist movement, was an agent for procedural change, and worked tirelessly as a reformer and fundraiser, making a positive difference in the lives of many young girls. 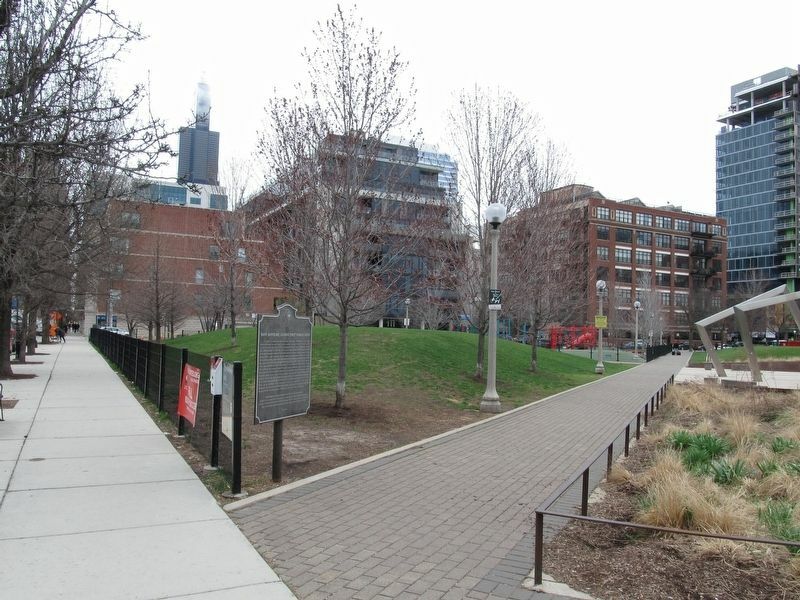 Erected 2011 by Alderman Robert W. Fioretti, Chicago Park District, University of Illinois at Chicago and Hull House Museum, Women’s Bar Association of Illinois, Northwestern University Law School, Scott R. Maeself Family, Leslie Recht, West Loop Community Organization, and The Illinois State Historical Society. Location. 41° 52.821′ N, 87° 39.033′ W. Marker is in Chicago, Illinois, in Cook County. Marker is at the intersection of West Monroe Street and South Sangamon Street, on the right when traveling east on West Monroe Street. Touch for map. Marker is located in the northwest corner of the park. Marker is in this post office area: Chicago IL 60607, United States of America. Touch for directions. Other nearby markers. At least 8 other markers are within walking distance of this marker. St. Patrick's Church (approx. 0.3 miles away); Site of the Haymarket Tragedy (approx. half a mile away); Jane Addams' Hull House (approx. 0.6 miles away); Jane Addams' Hull-House and Dining Hall (approx. 0.6 miles away); Chicago & North Western Railway Powerhouse (approx. 0.6 miles away); Saint Frances Xavier Cabrini (approx. 0.7 miles away); Site of the Sauganash Hotel/Wigwam (approx. 0.8 miles away); Wacker Drive (approx. 0.8 miles away). Touch for a list and map of all markers in Chicago. More. 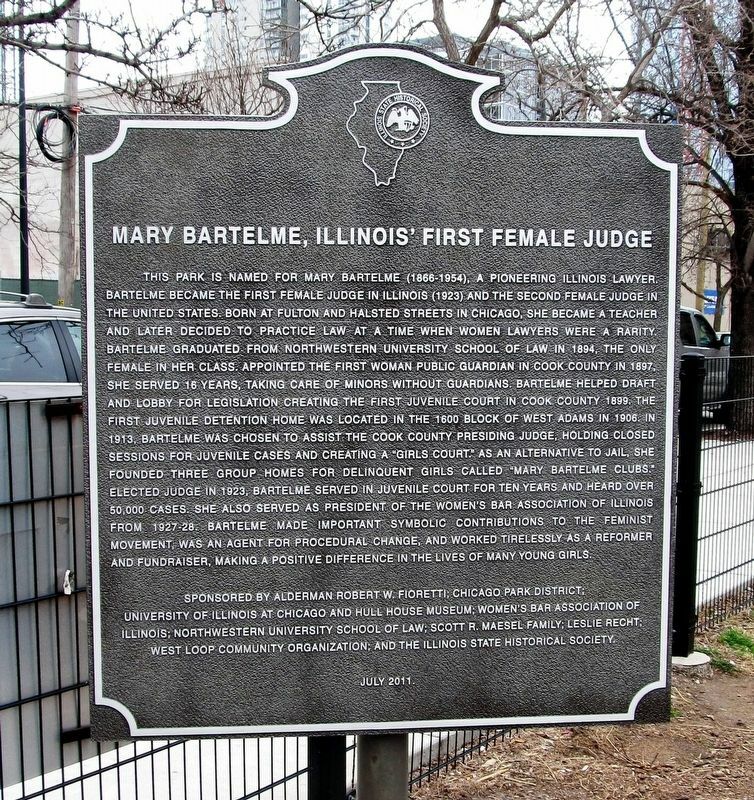 Search the internet for Mary Bartelme, Illinois’ First Female Judge. Credits. This page was last revised on April 13, 2019. This page originally submitted on April 11, 2019, by Paul Fehrenbach of Germantown, Wisconsin. This page has been viewed 32 times since then. Photos: 1, 2. submitted on April 11, 2019, by Paul Fehrenbach of Germantown, Wisconsin. • Andrew Ruppenstein was the editor who published this page.